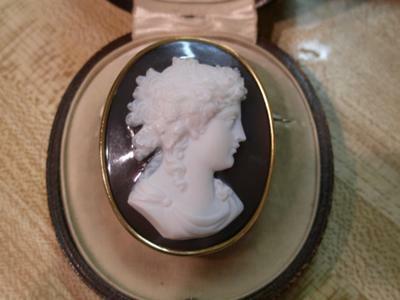 Hi, I've got an antique hardstone cameo with a gold mount. It was sold to me as 18K. I've had it tested by a goldsmith who said it was solid gold of at least 14K (he didn't have the acid solution for testing higher karats). The cameo is carved out of agate and the pin on the back fastens with the old C clasp. The pin also extends past the edge of the brooch by about 1/4 inch. (I'm told this helps to date the item). The thing is, it's got a very strange hallmark on it which I have not been able to identify. 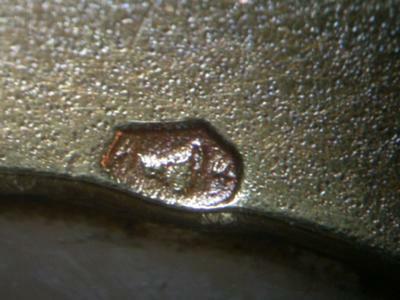 It resembles the Austro-Hungarian dog's head silver mark. But, this is definitely gold. However, it has the number 4 behind the creature's head. And perhaps a letter (H? I?) in front of the beast's nose. I thought at first that it was may the french horse's head, but it really doesn't look like a horse. More like an ugly dog. Perhaps a pig? The cameo is most likely of german origin since it's agate, so perhaps this is a german mark? I'm miserably, totally, and irrevocably stumped. I hope you can help.